In 1270, Eleanora of Castile accompanied her illustrious consort, Edward the First, then Prince Edward, to the third holy war, and was present before Acre, when one of the tribe of the Ansayrii, or " assassins," made his way into Edward's tent, and, while pretending to deliver a letter, attacked the prince with a poisoned dagger, inflicting a severe gash in his arm. 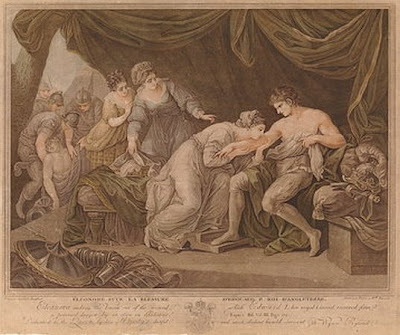 The miscreant was instantly slain by Edward ; and an old legend asserts, that Eleanora, utterly regardless of herself, sucked the poison from her husband's wound, and by this means saved his life. The story, however, is wholly repudiated by modern chroniclers, though it is difficult to imagine how it could have passed current at the time, when, as we are now taught, it was without the shadow of a foundation. Angelica Kauffman came to England from Switzerland in 1764 and spent 15 years here flaunting her own outrageousness: a founder member of the Royal Academy and one of the most celebrated narrative painters of her time, she was a woman in a man's man's man's man's world. Kauffman turned the perceived incongruity of her vocation to advantage by making it one of the prime subjects of her art. She did so most strikingly in her Self-Portrait Hesitating Between the Arts of Music and Painting, a work which now seems subtly proto-feminist in intention. .
Kauffman was not a great artist, although this may be as much down to her historical circumstances as to the nature of her talents. She was a history painter in Britain working at a time when history painting everywhere except France was a genre in near-terminal decline. Her attempts to find and paint grand themes congenial to English tastes led her, on more than one occasion, to desperately recherche subjects, as suggested by the crazy longueurs of some of her titles: The Tender Eleonora Sucking the Venom out of the Wound which Edward I, her Royal Consort, Received with a Poisoned Dagger from an Assassin in Palestine, or Lady Elizabeth Grey Imploring of Edward IV the Restitution of her Deceased Husband's Lands, Forfeited in the Dispute between the Houses of York and Lancaster. Kauffman's allegories may also be charged with a form of autobiographical significance. Her relationships with men do not seem (although it is hard to know how much of this is down to malicious rumour) to have been especially happy: she is said to have had affairs with, among others, Sir Joshua Reynolds, Henry Fuseli and the French revolutionary Jean Paul Marat; and shortly after her arrival in England she married, disastrously, a man calling himself Count Frederic de Horn who turned out to have at least one previous, undivorced wife and fled the country four months after marrying Kauffman. She may have had good reason to suspect the impetuosity of men. Kauffman may not have been quite as soft as the writer liked to think. She did remarkably well for herself in the 15 years that she spent in England, earning pounds 14,000, roughly the equivalent of pounds 750,000 in today's money. 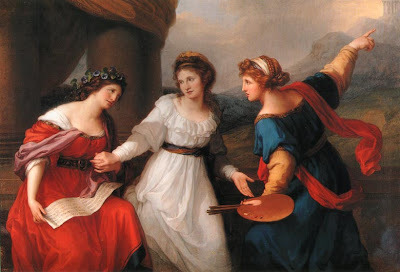 She knew how to market herself, and there may have been a certain element of self-satisfaction in that Self-Portrait Hesitating Between the Arts of Music and Painting: Angelica Kauffman knew that she had made the right choice.